What a great recipe from Health.com! It’s fast, beautiful, fresh and packed with some of my favorite ingredients. Don't have a grill at home? No worries. Searing scallops in a skillet works just as well. This recipe makes four very small portions or two normal sized entrees. 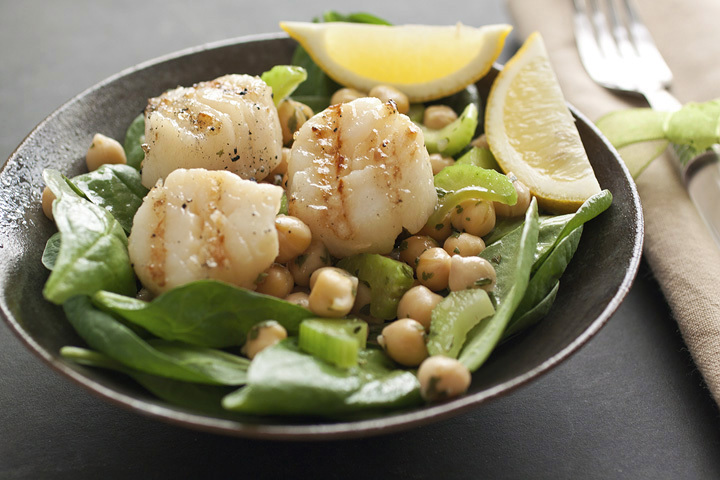 "The power duo of scallops and chickpeas provides fiber, vitamin B12, and omega-3 fatty acids, which are great for brain and heart health." 1. Preheat the grill to high. Pull beards off of scallops if they’re still attached. Set aside. 2. In medium-sized bowl combine chickpeas, garlic, celery, parsley, 2 tablespoons lemon juice, and 1 tablespoon olive oil. 3. In another medium-sized bowl combine 2 teaspoons olive oil and 1 tablespoon lemon juice. Season with salt and pepper and toss in scallops to coat. 4. Divide spinach onto four plates and evenly spoon chickpea mixture over the top. 5. Grill scallops for 2 to 3 minutes per side, until firm to the touch but not rubbery. Evenly divide among salads and serve immediately. Recipe from Health.com. Photograph by Laura Flowers. Laura, this is a very healthy, light, flavorful way to enjoy a meal. Awesome. This is a great salad idea. It does have some of my favorite ingredients too such as chickpeas, scallops, spinach, garlic, etc. I'm pretty sure i could devour all FOUR servings singlehandedly! Looks great! Laura...you've outdone yourself once again! This looks so so good!!! Yes agreed what a great recipe! I love your photo too, so great. Makes me want to dig right in. Thanks for sharing. Scallops are one of my favorite things to buy in the seafood case. This looks like a great recipe to feature them. Thank you for sharing such a yummy meal with me. My long day at work will be all the more sweeter now that I've visited your blog. Hugs from Austin!